Here is another recipe perfect for your holiday celebrations. Salted Caramel Pistachio Bark is super delicious! My husband almost at the whole thing in one sitting! This salted caramel pistachio bark would make a yummy treat for Santa too. All you need is 5 ingredients! If love pistachios as much as I do, you will also love this recipe. To make the caramel for this recipe, I just cooked down my Homemade Sweetened Condensed Milk. It worked great, although it does take some time to cook down. 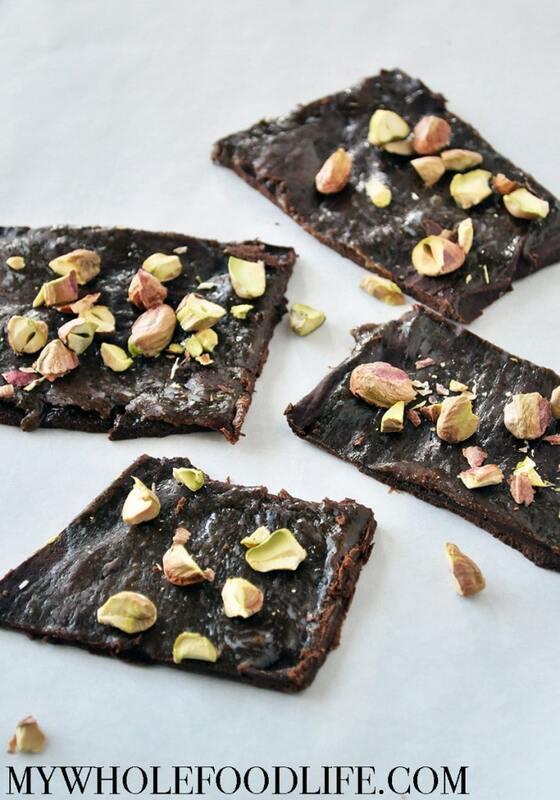 This yummy bark recipe is vegan, gluten free and paleo. I hope you enjoy it. In a double boiler, melt the chocolate and milk. Once smooth, spread onto a lined baking sheet . Swirl the caramel into the chocolate. Top with sea salt and pistachios. Place in the fridge to firm up. About 1 hour. For the caramel in this recipe, I used my vegan sweetened condensed milk recipe and just cooked it down into a caramel sauce. You can also make a caramel out of soaked dates if you like. Oooh these look super indulgent and yummy!!! I love how you've swirled the caramel in like that!